Where will your Tennessee Walking Horse take you today? The easy gait and willing personality of the Tennessee Walking Horse makes this the perfect breed for many competitive sports. Rail Classes, Driving, Gymkhana, Competitive Trail, Jumping, Reigning, Cowboy Mounted Shooting, Extreme Cowboy Races, Gaited Dressage, really the list is endless. TWHAWC holds 3 shows a year for rail, versatility and futurity classes (June-Sept). October sees our Fun Show with a team atmosphere and mounted games. Competitions not your thing, that's okay too. 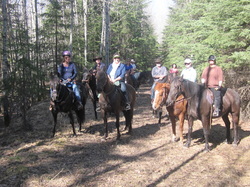 Their smooth ride allows the rider hours of riding with minimal fatigue. The only question is "Where will your Walking Horse take you today?" Year End High Point Awards are based on total points from all 4 shows and awarded at the December Christmas Party and meeting.